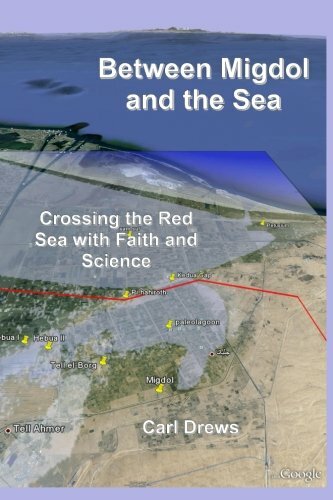 Between Migdol and the Sea (2014) presents a scientific view of Moses and the Israelites crossing the Red Sea, as described in the biblical book of Exodus. The crossing site is located in the eastern Nile delta, where the Pelusiac branch of the Nile river once flowed into a large coastal lagoon known as the Lake of Tanis. This research was published in several peer-reviewed publications (see below); the book presents the Tanis hypothesis for a general audience. 1) The Hebrew Exodus from Egypt really did happen. Migdol includes a detailed chronology that places the Exodus in 1250 BC, during the New Kingdom reign of Pharaoh Rameses II. Four candidates for Mt. Sinai are examined for agreement with the geography of the Exodus. Chapter 9 contains an extensive rebuttal to the claims of biblical minimalists Israel Finkelstein and Neil Silberman in The Bible Unearthed (2001). 2) Faith and science can and should be compatible with each other. The religious and scientific views of an event or natural phenomenon do not have to be in conflict. Between Migdol and the Sea demonstrates that when readers of the Bible are willing to consider other interpretations of the text, and when scientists are willing to acknowledge the limits of scientific inquiry, then Science can become the study of God's creation and His marvelous works. Faith and science both seek the Truth. Chapter 12 explains how these two disciplines should be mutually supportive and in harmony. Between Migdol and the Sea, by William Connolley at Stoat Science Blogs; 7 November 2014. The parting of the Red Sea: nature or divine intervention?, by Adam Woods at the London Daily Telegraph; 3 December 2014. No, really: There is a scientific explanation for the parting of the Red Sea in Exodus, by Chris Mooney at the Washington Post; 8 December 2014. The Science of the Red Sea's Parting: It is physically and scientifically possible for a body of water to part, by Rachel Nuwer at Smithsonian.com; 8 December 2014. Between Migdol and the Sea made the Amazon Best Seller list for Science & Religion (13 March 2015). Scientific Evidence for the Parting of the Red Sea, blog by Taryn Dryfhout, 28 August 2015. The parting of the Red Sea can be explained by science (English auto-translation of Veja article by Google). A well researched, well written, & very refreshing read!, Migdol book review at Amazon UK by DMtkv, 21 July 2016. The Power of the Human Spirit, by Jonathan Sacks at the Algemeiner Jewish and Israel news, 7 February 2017. Opinion: Science is scared of religion, by Zulfikar Abbany at Deutsche Welle, Easter Sunday, 1 April 2018. Are miracles 'outside the realm of science'?, by Zulfikar Abbany at Deutsche Welle, 11 April 2018. Assuming the exodus happened - where and when?, by David Corder at theoutwardquest, 30 April 2018. Carl Drews at Author Central. Book reviews written by Carl Drews at Amazon. Master's thesis: "Application of Storm Surge Modeling to Moses' Crossing of the Red Sea; and to Manila Bay, the Philippines", Department of Atmospheric and Oceanic Sciences, University of Colorado - Boulder, 2009. The thesis document is published by ProQuest, and is also available through the Chinook Library Catalog of the University of Colorado at Boulder. Drews, Carl, Weiqing Han, 2010: Dynamics of Wind Setdown at Suez and the Eastern Nile Delta. PLoS One, doi: 10.1371/journal.pone.0012481. Drews, Carl, 2011: Could wind have parted the Red Sea?. Weatherwise, doi: 10.1080/00431672.2011.536122. Drews, Carl, 2013: Using wind setdown and storm surge on Lake Erie to calibrate the air-sea drag coefficient. PLoS One, doi: 10.1371/journal.pone.0072510. Drews, Carl, and Thomas J. Galarneau Jr., 2015: Directional Analysis of the Storm Surge from Hurricane Sandy 2012, with Applications to Charleston, New Orleans, and the Philippines. PLOS One, doi: 10.1371/journal.pone.0122113. Drews, Carl, 2015: Directional Storm Surge in Enclosed Seas: The Red Sea, the Adriatic, and Venice. Journal of Marine Science and Engineering, doi: 10.3390/jmse3020356. Drews, Carl, 2015: Examining Exodus 14 with the Geosciences. Near East Archaeological Society Bulletin (NEASB) Volume 60, pages 1-15. To obtain a copy of this paper, please contact the Near East Archaeological Society. NCAR hosts the pre-print manuscript. Crossing the Red Sea at Aqaba? No. July 2015. Shallow Water Surges More: the mathematics behind wind setdown and storm surge. August 2015. Exodus: More Fact Than Fiction. November 2015. Tarik is patterned after two historical/literary characters, one ancient and one modern. Who are they? The first is fairly obvious. The second is much harder. The second one appears in Abraham Rabinovich's book The Yom Kippur War (2004). The Boromir meme from Lord of the Rings: "One does not simply walk into Mordor." Why did the windshield wipers on the 1960 Rambler American speed up while you were shifting gears? Where is there an allusion to The Hitchhiker's Guide to the Galaxy (1979), by Douglas Adams? How did Rameses II survive the Tenth Plague (death of the first-born son)? but it was given earlier in my blog series on Google Plus (read about Queen Tuya). What perfect square and perfect cube sum to equal the number of seeds painted on the back trunk of the watermelon car? The answers to solved puzzles will be posted on Google Plus after the 2015 Academy Awards. Was There an Exodus? by Joshua Berman, March 2 2015. (Yes!) Many are sure that one of Judaism’s central events never happened. Evidence, some published here for the first time, suggests otherwise. Joshua Berman is professor of Bible at Bar-Ilan University and at Shalem College in Israel, and a research fellow at the Herzl Institute. In this lengthy article at Mosaic magazine, Dr. Berman describes the evidence in favor of a historical Hebrew Exodus from Egypt. Although written independently, his reasoning has many simularities to the points I raise in my book Between Migdol and the Sea. "Many major events reported in various ancient writings are archaeologically invisible." There were not millions of Israelites. Archaeology has confirmed many aspects of the Exodus narrative that a later fabrication would be unlikely to get right. And Egyptian descriptions of the Battle of Kadesh have close parallels in the Exodus 14-15 account of crossing the Red Sea. Copyright 2014 by Carl Drews.